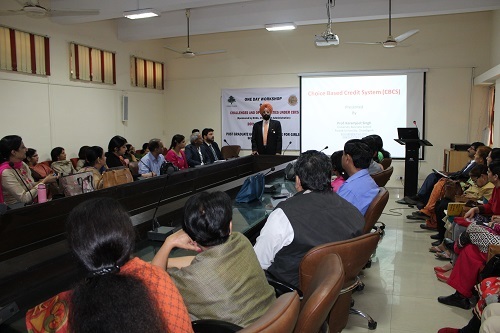 A One-day Workshop on “Challenges and Opportunities under Choice-based Credit System (CBCS)” was organised under the aegis of RUSA in P.G. Govt. College for Girls, Sector-11, Chandigarh today. Delegates from various colleges of the region participated in the Workshop. Prof. Anita Kaushal, Principal of the college accorded a floral welcome to the speakers. Introducing the proposed scheme, Prof. Karamjeet Singh, Director, Academic Staff College, PU, Chandigarh presented an overview of CBCS. Prof. P.K. Ahluwalia from Himachal Pradesh University, Shimla presented a case-study and underlined the various aspects and highlights of the scheme during the last three years of the system in HPU. Mr. Jaswinder Singh, Principal, Khalsa College, New Delhi elaborated the challenges in the implementation of CBCS. In the Panel-discussion, Dr. Dalip Kumar, Member, PU Syndicate; Prof. Pardeep Singh Walia, PG Govt. College for Girls, Sector-11, Chandigarh, and Dr. Jayanti Dutta, Deputy Director, Academic Staff College, PU, Chandigarh dwelled into various facets and dimensions of CBCS. In this interactive-session, various pros and cons of the scheme were deliberated upon, and doubts and questions of the delegates were discussed. Prof. Anita Kaushal also released a book on this occasion. The book compiled by Dr. Manoj Kumar, Assistant Professor, Department of Sociology has more than 50 papers presented in the National Seminar on ‘Human Rights of marginalised groups: Understanding and Rethinking Starategies’ organised earlier by the college.